Stax Records was not only the most successful soul music studio in history - recording the likes of Isaac Hayes, Otis Redding, and The Staple Singers - but also a cultural phenomenon. It furthered the ends of social integration at a time when segregation was still a grim reality in the USA. Although Stax Records was forced into involuntary bankruptcy at the end of 1975, its legacy lives on, in the form of the Stax Museum of American Soul Music. Located at the original site of Stax Records, the museum pays tribute to all of the artists who recorded there, with a rare and astonishing collection of more than two thousand interactive exhibits, films, artefacts, items of memorabilia, and galleries. 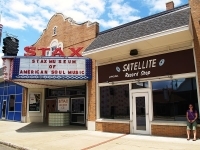 The only soul music museum in the world, the Stax Museum includes tributes to other influential soul music record labels, such as Motown, Hi and Atlantic Records. Artists that may not have released albums under the Stax Records label but were big players in the soul music world are also highlighted at the Stax Musuem - the Jackson Five, Aretha Franklin, Ray Charles and Ike, and Tina Turner, amongst others. Transport: $13 adults, $10 children, other concessions available. Opening times: Tuesday to Sunday 10am-5pm, closed Monday.